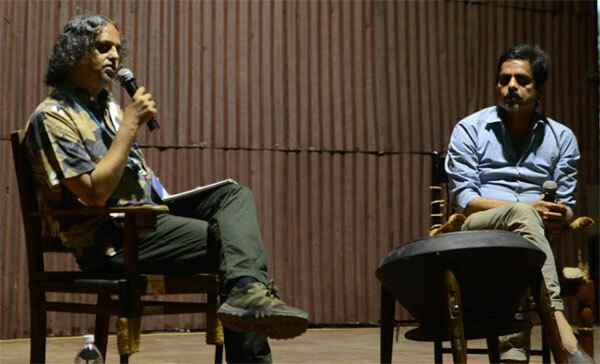 Kochi, December 14: The evolution of Sudarshan Shetty’s curatorial vision for Kochi-Muziris Biennale (KMB) 2016 and its relationship to his artistic practice formed the basis of an erudite conversation between Shetty and eminent philosopher Sundar Sarukkai here on Tuesday. Terming his curatorial impulse – as also the Biennale – a ‘work in progress’, Shetty noted that the twin processes of ‘gathering’ and ‘erasure’ were the event’s primary agencies and not his instincts as an artist. “It would be a disaster if I was to introduce myself into this mix,” he said. Shetty prefers to see himself as a facilitator instead, going with the flow as KMB 2016 changes organically over its duration and perhaps beyond. “I thought to side-step the image of an artist-curator as a creator or agent of knowledge and culture and become a presenter, bringing about this conversation between different art streams and traditions,” he said. Thus, while he brought the Biennale’s divergent components together into an inclusive space, it would gather additional layers of meaning on its own – erasing parts of itself over time to make space for other things while the residuals would keep changing with the event. “I envision the Biennale as existing both as transformative space and experience,” Shetty said. The evening discussion at the Biennale Pavilion in Cabral Yard, Fort Kochi, saw Sarukkai probe Shetty on the nature of his core curatorial premise of ‘multiplicity’. “The Biennale straddles multiple perspectives, possibilities and positions. It does not seek to question what is ‘real’ and what is ‘representational’. This layering of multiple viewpoints on reality informs ‘Forming in the pupil of an eye’, as it attempts to intertwine the conceptual with the corporeal,” Shetty said. Riffing on Shetty’s definition of multiplicity, Sarukkai probed whether the Biennale was then ‘a process’ instead of ‘an occurrence’. Shetty said he preferred to think of it as ‘an attempt’. “By bringing parallel disparate narratives into the story of Biennale, like a river fed by its tributaries, it attempts to negotiate the tensions that come out of the assimilation of these perspectives. This lets the Biennale accumulate meaning as it unfolds,” he said. Coming to terms with his curatorial responsibility, though, was a long-drawn process, Shetty acknowledged. “When I was first thinking about my idea for the Biennale, I thought it would be an extension of my own practice. Over the past year, there was this need to look outside, to get into new spaces, to bring in new ideas and also to reflect on who my audience is,” he said. This ‘need’ compelled Shetty to search for ways to bring in to the biennale space people, forms and practices that are seemingly outside it: poetry recitals, mobile lecture tours, architecture, dance performances and theatre productions, among others. The result of that search has been the inclusion of the diverse forms and approaches to art production that has come to characterise the third edition of India’s only Biennale.